The conflict in Syria has entered its eighth year with no end in sight. Whether it is called an insurgency, rebellion, uprising, or civil war, the tragedy has not only killed thousands of people and displaced millions more, it continues to change the political landscape of the entire Middle East. Moreover, the complex mix of tribal, ethnic, national, and religious groups involved have made it difficult to analyze and understand. Professor William Harris does a remarkable job in sorting through the tangled web of shifting loyalties and interests in this new book, an excellent introduction for anyone trying to understand the origin, course, and perhaps ultimate outcome of this conflict. A caveat up front—Professor Harris assumes the reader has a basic understanding of Middle Eastern politics, in particular the various interest groups and sectarian rivalries in Iraq and Syria running up to the 2011 crisis, and although he does a solid job setting the stage for the events leading to the Arab Spring and its impact in Syria, unfamiliar readers will want to make use of the extensive glossary that describes myriad armed groups involved in the conflict. The book is laid out in a hybrid narrative and analytic style. Professor Harris begins with two excellent chapters narrating the early stages of the war in Syria from 2011–2014, then the wider war stretching from the Lebanese border, across Syria, to the gates of Baghdad and the northern regions of Iraq from 2014–2017. These chapters describe the initial uprising against the oppressive dictatorship of Bashir Assad; characterize the burgeoning Islamist groups that eventually give rise to ISIS, and then detail the remarkable offensive actions of ISIS into eastern Syria and western Iraq that creates the nascent Islamic State. These chapters not only describe the military actions, but the resulting political changes as the Iraqi and Syrian governments attempt to confront ISIS with varying degrees of success. The regional intervention of Iran, Turkey, Saudi Arabia, and the Gulf States is also detailed, as well as the eventual superpower involvement of Russia and the United States. 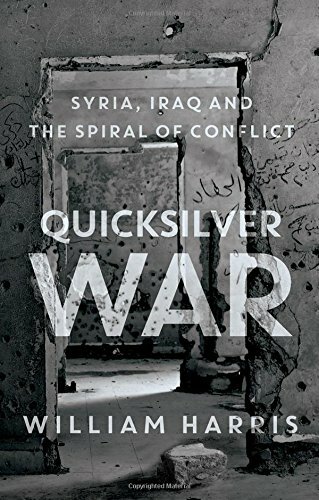 His analysis is timely and unstinting as Professor Harris tracks the often shifting alliances, objectives, and commitments of each player—hence the very apt title of the Quicksilver War. This section of the book ends with the methodical and destructive recapture of the Iraqi city of Mosul and its environs, a tragic urban conflict that reduced much of Iraq’s second largest city to rubble. The next two chapters examine the most critical regional players—Turkey and the various Kurdish groups in both countries. These chapters, particularly his insights on the disparate Kurdish groups is particularly interesting, as the Kurds have long been the largest minority group in the region without a country, and in this conflict they remained one of the few ethnic groups able to withstand the ISIS onslaught. Unfortunately, as the book points out, their own political infighting and fragmentation has prevented them from translating their battlefield prowess into lasting autonomy or independence. The Kurdish issue will likely continue far beyond the eventual destruction of ISIS, as Iraq, Syria, and Turkey will not likely be able to contain their minority Kurdish national aspirations. Like the conflict itself the book ends on a somber and inconclusive note, and Professor Harris offers scant comfort that the conflict will resolve itself anytime soon. Instead, it is likely to continue as a bloody and inconclusive stalemate as the Assad regime maintains control of the western part of the country, particularly Damascus and Homs, with the help of Russian material assistance and air power, and a shifting group of Syrian Kurds, Islamist groups, and assorted anti-regime militias vie for the ungovernable spaces of eastern Syria. Even the nominal assertion of Iraqi government control of previously ISIS occupied territory may not end their influence among disaffected Iraqis as the Sunni-Shia sectarian chasm remains unbridged. The increasing likelihood of Russo-American military confrontation also continues in the region, and neither superpower appears to be drawing down their forces or involvement. Well written and researched, this is an outstanding primer to understanding this very complex and tragic conflict and is one of the few really comprehensive works that attempts to tackle the conflict as a truly regional security issue.